This article is about the Persian ethnic group. For other uses, see Persian. Primarily Shia Islam, as well as Irreligion, Christianity, the Bahá'í faith, Sunni Islam, Sufism, Judaism, and Zorastrianism. The Persians (Persian: پارسیان‎‎ – Pārsiān) are an Iranian ethnic group native to Iran, who share a common ancestry and cultural system. They are native speakers of the Persian language, as well as closely related dialects and languages. The ancient Persians were originally a nomadic branch of the Iranians who entered modern-day Iran by the early 10th century BC. Together with their compatriot allies, they established and ruled some of the world's most powerful empires, well-recognized for their massive cultural, political and social influence covering much of the territory and population of the ancient world. Persians contributed greatly in various forms of art, including carpet-waving, pottery, mosaic, miniature painting, calligraphy, and music. They own one of the world's oldest and richest literary traditions, and have also left significant influences in architectural and scientific concepts. The English term Persian derives from Latin *Persia, itself deriving from Greek *Persís (Περσίς), a Hellenized form of Old Persian *Pārsa (𐎱𐎠𐎼𐎿). In the Bible, it is referred to as Parás (Hebrew: פָּרָס‎‎)—sometimes Paras ve Madai (פרס ו מדי; "Persia and Media")—within the books of Esther, Daniel, Ezra and Nehemya. The term Persia was adopted through Greek sources, used as an official name for the entire Iran for many years. Thus, the term Persian came to refer to all inhabitants of the country. Some medieval and early modern Islamic sources also used cognates of the term Persian to refer to various Iranian peoples, including speakers of the Chorasmian language, the Tapurian language, and the Old Azeri language. The Iraqi historian Al-Masudi (896–956) refers to Pahlavi (Middle Persian), Dari (Early Modern Persian) and Azari (the Old Azeri language) as dialects of the Persian language. Lady Mary (Leonora Woulfe) Sheil, in her observation of Iran during the Qajar era, describes Persians, Kurds and Leks to identify themselves as "descendants of the ancient Persians". On 21 March 1935, the ruler of the country, Reza Shah, issued a decree asking the international community to use the term Iran—which was the native name of the country—in formal correspondence. Since then, the term Iranian and Persian were applied interchangeably to the population of Iran. The term Persian is still historically used to designate the predominant population of the Iranian people living in the Iranian cultural continent. The earliest known written record attributed to the Persians is from the Black Obelisk of Shalmaneser III, an Assyrian inscription from the mid-9th century BC, found at Nimrud. The inscription mentions Parsua (presumed to mean "border" or "borderland") as a tribal chiefdom (860–600 BC) located near Lake Urmia in the region between the Avroman range and Sena Dezh (Central Zagros), in modern-day northwestern Iran. The ancient Persians were originally a nomadic branch of the Iranian population that, in the early 10th century BC, settled to the northwest of modern-day Iran. They were initially dominated by the Assyrians for much of the first three centuries after arriving in the region; but however, they played a major role in the downfall of the Neo-Assyrian Empire. 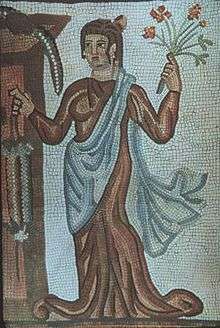 The Medes, another branch of this population, founded the unified empire of Media as the region's dominant cultural and political power in c. 625 BC. Meanwhile, the Persian dynasty of the Achaemenids formed a vassal state to the central Median power. In c. 552 BC, the Achaemenids began a revolution which eventually led to the conquest of the empire by Cyrus II in c. 550 BC. They spread their influence to the rest of what is called the Iranian Plateau, and assimilated with the non-Iranian indigenous groups of the region, including the Elamites and Mannaeans. Until the Parthian era, the Iranian identity had an ethnic, linguistic, and religious value; but however, it did not yet have a political import. Parthian, a mutually intelligible language with the Middle Persian language, became an official language of the Parthian Empire. It had influences on the modern Persian language, as well as a major influence on the neighboring Armenian language. 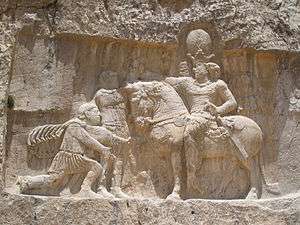 Roman emperor Valerian and Philip the Arab accepting defeat by the Sassanid emperor Shapur I. The Parthians and the Sassanids would also extensively interact with the Romans culturally. 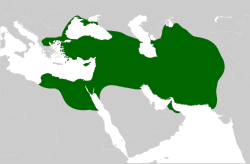 The Roman-Sassanid Wars and the Byzantine-Sassanid Wars would shape the landscape of Western Asia, Europe, the Caucasus, North Africa, and the Mediterranean Basin for centuries. For a period of over 400 years, the neighboring Byzantines and Sassanids were recognized as the two leading powers in the world. The intermingling of Persians, Medes, Parthians, Bactrians and indigenous "pre-Iranian" people of Iran (incl. the Elamites) gained more ground, and a homogeneous Iranian identity was created to the extent that all were just called Iranians, irrespective of clannish affiliations and regional linguistic or dialectical alterities. Furthermore, the process of incomers' assimilation which had been started with the Greeks, continued in the face of Arab, Mongol and Turkic invasions and proceeded right up to Islamic times. In modern-day Iran, Persians make up the majority of the population. They speak the western dialects and varieties of the modern Persian language, which also serves as the country's official language. The Persian language and its various varieties are part of the Western group of the Iranian branch of the Indo-European language family. It is classified as a continuation of Middle Persian, the official religious and literary language of the Sassanid Empire, itself a continuation of Old Persian, which was spoken by the time of the Achaemenid Empire. Old Persian is one of the oldest Indo-European languages which is attested in original texts. Examples of Old Persian have been found in what is now present-day Iran, Armenia, Romania (Gherla), Iraq, Turkey and Egypt. The oldest known text written in Old Persian is from the Behistun Inscription. There are several peoples and communities which are either ethnically or linguistically related to the Persian people, living within various regions of modern-day Iran, the Caucasus, Tajikistan, Afghanistan, Turkey, Iraq, and the Persian Gulf states. The Lurs, living primarily in western and southwestern Iran, are another ethnic Iranian people often associated with Persians and Kurds. They speak various dialects of the Lurish language, which is closely related to Middle Persian. The Caucasian Tat people—concentrated in Azerbaijan, Armenia, and Russia (Dagestan)—are an ethnic Iranian people whose origin is traced to the merchants who settled in the region by the time of the Sassanid Empire. They speak the Caucasian Tat language, which is considered a variant of Persian. The Tajiks, Farsiwan, Hazara and Aimaq are a number of diverse Persian-speaking ethnic groups living predominantly in Afghanistan, Tajikistan and Uzbekistan. They speak various dialects of Dari and Tajik, which are two other varieties of the modern Persian language. From the early inhabitants of Persis, to the Achaemenid, Parthian, and Sassanid empires, to the neighbouring Greek city states, the kingdom of Macedon, the caliphates and the Islamic world, all the way to the modern day Iran and Western Europe, and such far places as those found in India, Asia, and Indonesia, Persian culture has been either recognized, incorporated, adopted, or celebrated. This is due mainly to its geopolitical conditions, and its intricate relationship with the ever-changing political arena once as dominant as the Achaemenid Empire. Sassanid floor mosaic detail from the palace of Shapur I. The artistic heritage of the Persians is eclectic, and includes major contributions from both the east and the west. Persian art borrowed heavily from the indigenous Elamite civilization and Mesopotamia, and later from the Hellenistic civilization. In addition, due to the somewhat central location of Iran, it has served as a fusion point between eastern and western traditions. The Persian language is known to have one of the world's oldest and most powerful literatures, with prominent medieval poets such as Ferdowsi, Roudaki, Rumi, Hafez Shirazi, Saadi Shirazi, Nizami Ganjavi, Omar Khayyam, and Attar of Nishapur. Not all Persian literature is written in Persian, as some consider works written by Persians in other languages—such as Greek and Arabic—to be included. At the same time, not all literature written in Persian is written by ethnic Persians or Iranians, as Turkic, Caucasian, and Indic poets and writers have also used the Persian language in the environment of Persianate cultures. One of the most notable Persian literary works is the long epic poem Šāhnāme ("The King Book") by the 10th-century eminent poet Ferdowsi, which is considered the national epic of the historical region of Greater Iran. Prominent writers such as Sadegh Hedayat, Forough Farrokhzad, Ahmad Shamlu, Simin Daneshvar, Akhavan-Sales and Parvin E'tesami have also had major contributions to the contemporary Persian literature. The most prominent examples of ancient Persian architecture are the work of the Achaemenids hailing from Persis. 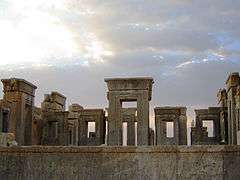 The quintessential feature of the Achaemenid architecture was its eclectic nature, with elements of Median, Assyrian, and Asiatic Greek all incorporated. Achaemenid architectural heritage, beginning with the expansion of the empire around 550 BC, was a period of artistic growth that left an extraordinary architectural legacy ranging from Cyrus the Great's solemn tomb in Pasargadae to the splendid structures of the opulent city of Persepolis, and such historical sites as Naqsh-e Rustam. During the Sassanid era, multiple architectural projects took place, some of which are still existing, including the Palace of Ardeshir, the Sarvestan Palace, the castle fortifications in Derbent (North Caucasus, now part of Russia), and the ruins at Taq Bostan. The Bam Citadel, a massive structure at 1,940,000 square feet (180,000 m2) constructed on the Silk Road in Bam, is from around the 5th century BC. 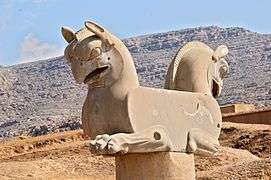 A griffin capital in Persepolis. Modern contemporary architectural projects influenced by the ancient Achaemenid architecture include the Mausoleum of Ferdowsi erected under the reign of Reza Shah in Tus, the Azadi Tower erected in 1971 in Tehran, and the Dariush Grand Hotel located on Kish Island in the Persian Gulf. The Great King [Cyrus II]...in all the districts he resides in and visits, takes care that there are paradises as they [Persians] call them, full of the good and beautiful things that the soil produce. For the Achaemenid monarchs, gardens assumed an important place. 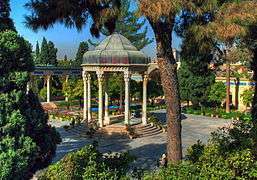 Persian gardens utilized the Achaemenid knowledge of water technologies, as they utilized aqueducts, earliest recorded gravity-fed water rills, and basins arranged in a geometric system. The enclosure of this symmetrically arranged planting and irrigation, by an infrastructure such as a building or a palace created the impression of "paradise". Parthians and Sassanids later added their own modifications to the original Achaemenid design. 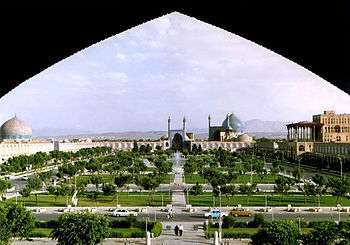 Later, the quadripartite design (Čārbāq) of Persian gardens was reinterpreted by the Muslim world. 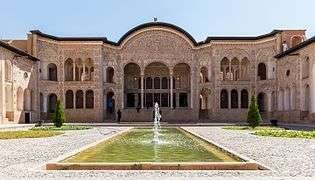 Today, some of the best examples of the traditional gardens can be seen in such places as the Shazdeh Garden, Golshan Garden, Qavam House, Fin Garden, Tomb of Hafez, Eram Garden, Tabatabaei House, and the Borujerdis House. A carved relief from Taq Bostan, depicting Sassanid women playing the chang—a musical instrument utilizing five strings under tension to create musical tones. According to the accounts reported by Xenophon, a great number of singers were present at the Achaemenid court. However, little information is available from the music of that era. 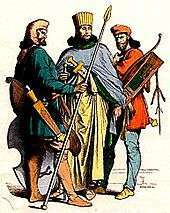 Sassanid music, however, was influential, and was later adopted in the subsequent eras. In traditional Sassanid music, the octave is divided into seventeen tones, while by the end of the 13th century some music from Persia also maintained a twelve interval octave, which resembled the western counterpart. Persian music utilizes a variety of musical instruments that are unique to the region, and has evolved since its ancient and medieval times. In terms of comparison between the basic style of music, employment of smaller intervals, and the transition from one key to another by progressions that are minute compared to their European counterparts, is what gives Persian music its unique quality. 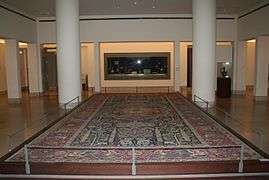 World's oldest existing carpet, the Pazyryk carpet, a pile-carpet dating back to 400–300 BC, depicts elements of Assyrian and Achaemenid design, including stylistic references to stone slab designs found in Persian palaces. Achaemenid rug and carpet artistry is well recognized, as Xenophon describes the carpet production in the city of Sardis, then a province of the Achaemenid Empire, stating that the locals take pride in their carpet production. Special mention of Persian carpets are made by Athenaeus of Naucratis in his Deipnosophists, as he describes "a delightfully embroidered Persian carpet" having some "preposterous shapes of griffins". 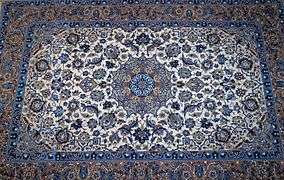 An Isfahan rug made by Mohammad Seirafian. One of the most recognized traditions observed by the Persians is the festival of Nowruz. Considered the national New Year of the Iranian people, the festival of Nowruz has its roots in ancient Iranian traditions, and has been recognized by the UNESCO as an "Intangible Cultural Heritage of Humanity". Festivals such as Charshanbe Suri (a prelude to Nowruz, celebrated by jumping over bonfires), Sizde be Dar (a picnic festival celebrated on the thirteenth day of the Iranian New Year) and Yalda (the longest night of the year, celebrated on the eve of Winter Solstice) are also widely celebrated by the Iranian peoples. ↑ Library of Congress, Federal Research Division. "Ethnic Groups and Languages of Iran" (PDF). Retrieved 2009-12-02. ↑ R. N. Fyre, "IRAN v. PEOPLES OF IRAN" in Encyclopaedia Iranica, "The largest group of people in present-day Iran are Persians (*q.v.) who speak dialects of the language called Fārsi in Persian, since it was primarily the tongue of the people of Fārs." ↑ Kathryn M. Coughlin, "Muslim cultures today: a reference guide," Greenwood Publishing Group, 2006. pg 89: "...Iranians speak Persian or a Persian dialect such as Gilaki or Mazandarani"
1 2 "Iran :: Ethnic groups – Britannica Online Encyclopedia". .britannica.com. Retrieved 2012-06-10. 1 2 David Sacks; Oswyn Murray; Lisa R. Brody (2005). Encyclopedia of the ancient Greek world. Infobase Publishing. pp. 256 (at the right portion of the page). 1 2 Encyclopædia Britannica. 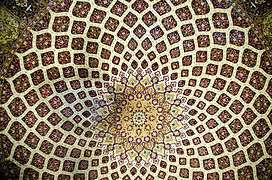 "Encyclopædia Britannica Encyclopedia Article: Media ancient region, Iran". Britannica.com. Retrieved 25 August 2010. ↑ Edward Farr (1850). History of the Persians. Robert Carter. pp. 124–7. ↑ "Persian". Encyclopædia Britannica. Retrieved Feb 6, 2011. ↑ "Persian entry in the Merriam-Webster online dictionary". Merriam-webster.com. 2010-08-13. Retrieved 2012-06-10. ↑ Eduljee, K D. "Zoroastrian Heritage The Zagros". 2012. The Heritage Site. Retrieved 9 April 2014. ↑ Charles Gates (2003). Ancient cities: the archaeology of urban life in the Ancient Near East and Egypt, Greece and Rome. Psychology Press. p. 186. ↑ "History of Iran". Iranologie.com. Retrieved 2012-06-10. ↑ "The World Factbook". Central Intelligence Agency. ↑ "Persian". University of Cambridge. Retrieved 16 July 2013. ↑ "SociolinguistEssex X – 2005" (PDF). Essex University. 2005. p. 10. ↑ Beeman, William. "Persian, Dari and Tajik" (PDF). Brown University. Archived (PDF) from the original on |archive-url= requires |archive-date= (help). Retrieved 30 March 2013. ↑ George Grote (1899). Greece: I. Legendary Greece: II. Grecian history to the reign of Peisistratus at Athens, Volume 12. P. F. Collier. p. 106. 1 2 Ira Marvin Lapidus (2002). A history of Islamic societies. Cambridge University Press. p. 127. ↑ Richard G. Hovannisian (1998). The Persian presence in the Islamic world. Cambridge University Press. pp. 80–83. ↑ Krishna Chandra Sagar (1992). Foreign influence on ancient India. Northern Book Centre. p. 17. ↑ Bertold Spuler; M. Ismail Marcinkowski (2003). Persian historiography and geography: Bertold Spuler on major works produced in Iran, the Caucasus, Central Asia, India, and early Ottoman Turkey. Pustaka Nasional Pte Ltd. pp. multiple pages & Back cover. ↑ Margaret Christina Miller (2004). Athens and Persia in the Fifth Century BC: A Study in Cultural Receptivity. Cambridge University Press. pp. 243–251. ↑ Sibyl Marcuse (1975). A survey of musical instruments. Harper & Row. pp. 398–401.